Michael Allan. 2007-2009, 2011. The structuring of power and the composition of norms by communicative assent. SourceForge.net, project Votorola, release 0.2.3, file d/theory.xht. http://sourceforge.net/project/showfiles.php?group_id=204780. Revision history: http://reluk.ca/var/db/repo/votorola/file/b3ebd2942e4d/votorola/d/theory.xht. A conceptual overview that is not currently maintained. It remains informative, even though partly outdated by the invention of pipes. Introduces a medium of communicative assent for the purpose of consensus building. 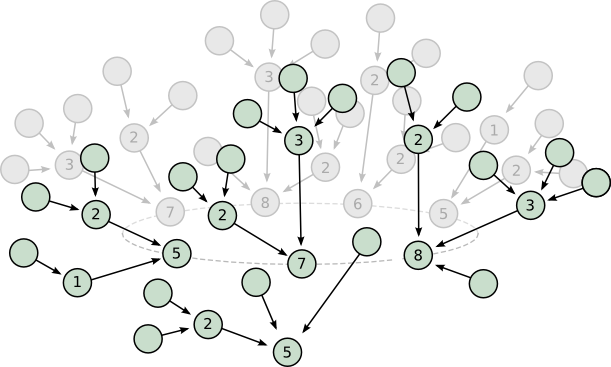 The backbone of the medium is a peer-to-peer voting mechanism that is open to continuous recasting (delegate cascade). It differs from the conventional media of mass assent in preserving the deliberative basis of consensus, regardless of scale. Explains how the medium may function as a primary electoral system, one in which candidates for executive office are nominated by open, cross-party consensus. Defines the ultimate election of a consensus candidate as an instance of communicative action by society as a whole. Defines assent as a steering medium, alongside money and power, and describes how it might rationalize the relations between lifeworld and system. Describes how the structure of assent may serve as scaffolding for the construction of power. Explains how the medium may be combined with a peer-to-peer medium of collaborative drafting (recombinant text), in order to build consensus on the composition of societal norms (laws, plans and policies). Describes how vote flow and text flow are interwoven in the composition, such that voters and drafters are made equal in its authorship. Suggests how a consensus norm might be actualized by government. Provides an example from a legislative context, in which the unofficial participation of assembly members opens a “public bridgehead” into the legislature. Every eligible participant has a single vote, and is therefore a potential voter. She may either withold her vote or cast it. She may vote for anyone. There are no pre-declared candidates. All participants are eligible to receive votes. All non-participants are also eligible. A non-participant who receives a vote is thereby made a participant, in the role of candidate. Votes are open to recasting. If a voter changes her mind about a candidate, she is free to withdraw her vote, or to recast it for another candidate. Voting is intended to remain open indefinitely, year round, with the votes shifting as new information becomes available to the participants. The results are never final. Assent for each candidate is measured by the quantity of votes received (circled numbers in figures 1 and 2). Note that a single vote may be received by multiple delegates before it is received by the final candidate. As each delegate or candidate receives the vote, her measure of assent is incremented. When the vote reaches the final candidate from whom it can flow no farther, it is “held” by that candidate. The total of votes held (red numbers) has, in itself, no bearing on the measure of assent; only the total received (circled numbers). Figure 2. Cyclic cascade. Depicts a cascade that has formed into a ring structure. It is nearly perfect, but a single voter from outside has injected a vote. 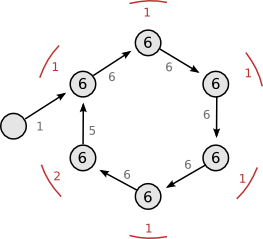 The vote circles until it stops at one of the candidates, who consequently holds two votes (red numbers). Despite this, assent within the ring is equally distributed, at 6 per candidate. A vote never actually cycles. 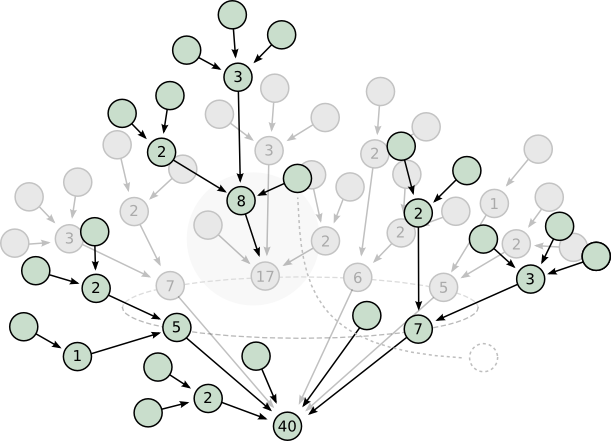 It flows through every candidate exactly once, but stops before it would re-encounter a candidate for a second time. It then remains held where it is. Consequently the level of assent is equal for all candidates in a cycle (cyclers). A vote also stops before it encounters its original caster. Consequently a vote for oneself has no effect. Figure 3. Tight cycles. The tightest cycle is actually between two voters (left). A cycle with a single voter (right) is a null cycle, equivalent to a withheld vote. Assent is the expression of agreement. Each particular instance of assent is formalized in the medium by the casting of a vote. The vote is cast for the person who best represents the act agreed to. (It is always an act.) For example, Juanita may propose to build a sandbox for children in the neighbourhood park. Samantha may agree to this act, and may formally express her agreement by voting for Juanita. A participant has a single vote for every separately polled act. If Juanita also proposes that Rajiv be appointed as Park Superintendent, then Samantha could vote for Juanita on that act, too. The two votes — one to build the sandbox, and one to appoint the superintendant — would have no formal connection to each other. They would be cast in separate polls. A poll is a collection of votes for measuring consensus or dissensus among voters. Variant acts may be proposed. Variant acts are alternatives to the originally proposed act, and not separately polled acts. When a variant act is proposed, the participant does not gain another vote to cast. Instead she gains a choice of which act to vote for. She may choose either the originally proposed act, or the variant, or neither (abstaining). Thus Monika may hear of Juanita's plan, and join Samantha in voting for it (plan A). She might suggest, at the same time, that the sandbox ought to be larger than Juanita is proposing (plan B). Samantha might shift her vote to Monika as a sign of approval for plan B, or she might keep it with Juanita. She would have a choice. The objects of the choice (original and variant acts) are called candidates. A candidate always has two aspects: an active aspect, and a personal aspect. The active aspect is the proposed act. The personal aspect is the person who proposes, or represents, or embodies the act. Thus the building of the larger sandbox (act) and Monika (person) are one and the same candidate. We can speak of voting for a larger sandbox, or of voting for Monika, but the two have the same meaning. The personal aspect of a candidate is formalized in the medium by a personal identifier, so one always knows who the candidate is for any vote that was cast. But the active aspect is only formalized optionally, by a link. Thus Monika may have a web page that details the dimensions of her enlarged sandbox. She may formally link her candidacy to that page in order that people may discover what she is proposing, without personally asking her. But this is optional. The separate candidates need not be mutually exclusive. We know that delegation may enable a single vote to be received by multiple candidates, thereby expressing agreement to multiple, simultaneous acts. We expect those acts to be, in some sense, logically compatible with each other. Thus by continuing to vote for Juanita, even while proposing a somewhat different plan, Monika might be hoping that Juanita will eventually agree to amend her own plan. Then, if Samantha were to shift her vote to Monika, she might be aiming to further that amendment. So, with a single vote, Samantha could express her assent for both candidates, and her desire of seeing them work together. Assent may build as new participants join in the voting. The votes are public, so each newcomer can discover who is involved, and what they have agreed to. The newcomer may join in the ongoing discussion between a candidate and her voters, and may cast a vote of her own. She may propose new candidates and invite other participants to join. And so on. A consensus that originally formed among 2 or 3 people might therefore grow a little larger. In principle, there might be no limit to its size. Before going farther, however, it is important to consider how this differs from conventional voting. Figure 4. Mass assent. The same two cascades as in figure 1, but without any actual delegation. Here each voter has recast for the consensus candidate who currently holds her vote. As a consequence, the tree structures have assumed a star pattern, typical of mass voting media. 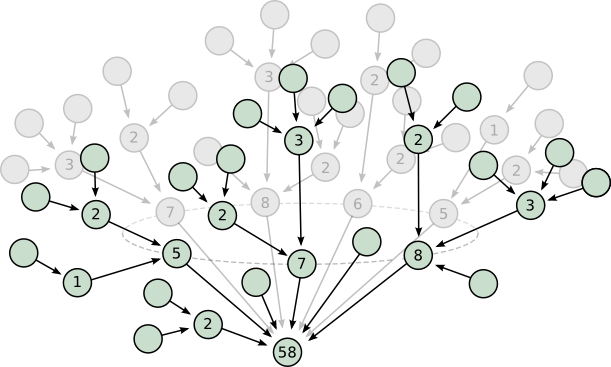 Figure 4 illustrates the case in which the voters avoid delegation and cast directly for root candidates. Instead of a tree, the result is an imploded star pattern typical of mass voting media. There are many voters, no delegates and only a few candidates. Mass voting imposes a limit not to the scale of assent itself, but to the scale of discussion. Because the number of candidates is restricted and the number of voters is not, there is a point at which discussion between voters and candidates is no longer possible. That point is the boundary between communicative assent and mass assent. By contrast, if assent is being mediated by a delegate cascade, the newcomer finds it easier to join the process. She can discover what is at stake by asking any of the voters or delegates in the outer branches of the cascade. She can go shopping among the delegates, using her vote as leverage to enter discussions, and maybe to gain concessions. She can make suggestions. She can even solicit votes herself and thus increase her leverage, and her ability to move deeper in the cascade. It does not matter to her if a dozen participants are involved, or a neighbourhood, or a whole city. The discussion is no less lively for all its extent, and no less inviting to newcomers. The improvements might be as simple as adding a new sandbox for children, or as complex as renovating the athletic facilities. The number of participants might be a hundred for a small neighbourhood, or ten thousand for a large one. In any case, once they had reached a rough consensus, government would be prompted to act. The reasons why are hidden in the underlying details of the scenario. Before looking at them, it will help to consider how communicative assent may express itself in mass elections. This section explains how large scale assent in the public sphere may be actualized, such that society as a whole becomes engaged in communicative action. In other words, after people agree to something, it actually gets done. This depends on the interrelations between communicative assent and administrative power, particularly with regard to the election of executive officers and the delegation of their powers. Adminstrative power in modern democracies is controlled by electoral systems. Adding a new voting medium to the public sphere cannot change the structure of these electoral systems, but it can change who is elected through them. Ordinarilly a candidate of an organized political party is elected. The path to election is shown in figure 5. The candidate is first chosen by the party members in a primary election (1), then wins mass assent in a general election (2), and finally enters office (3). Figure 5. Electoral relations between the public sphere and the administrative system. 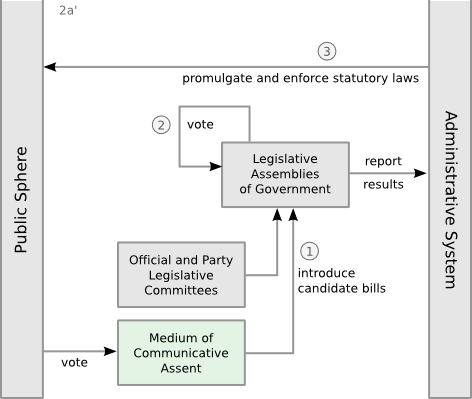 Detailing a transformed citizenship interchange (2a' from figure 7) as it functions in the election of public officials. The structural difference from the original interchange (2a) is a medium of communicative assent (green) that is added to the public sphere. This same election path would be open to candidates from the medium of communicative assent. The medium may therefore serve as a primary electoral system, much like the primary electoral systems of the parties. The medium is not, however, a political party. It has no leader, no staff and no members. It has no proper name, serves no particular interests, and has no status as “registered party”. Nevertheless it may serve many of the same functions as a party. A voter who did not wish to support any of the endorsed party candidates might use the medium to nominate her own candidate. She could do this simply by casting a vote. Other participants might join her by casting their own votes, and some of them might nominate additional candidates of their own. If the medium was used in this way, then it would come to occupy the same political “niche” as the parties, without itself being a party. It would therefore be competitive with the party system as a whole. To be truly competitive, however, it must meet two requirements: 1) sufficient voter turnout in the medium; and 2) faithful carriage of votes from the medium to the general polls. First of all, the primary turnout must be high enough to indicate that at least one candidate has substantial electoral support. The turnout need not match the level of general turnout on election day, but it ought to be high enough for each candidate to extrapolate the results, and gauge her level of support in the general electorate. Otherwise they might not bother to register for the general election (step 1 in figure 5). The second requirement is that the voters must faithfully carry their votes over to the general polls on election day (step 2). They would have to translate assent from a communicative medium to a mass medium. Figure 6 shows what is involved in the translation with respect to a single winner, plurality election.13 Each voter recalls the name of the candidate who currently holds her vote in the cascade (a name she knows well enough, or her delegate reminds her), and casts a vote for that same candidate at the general polling station. Figure 6. Translation of assent from a communicative to a mass medium. 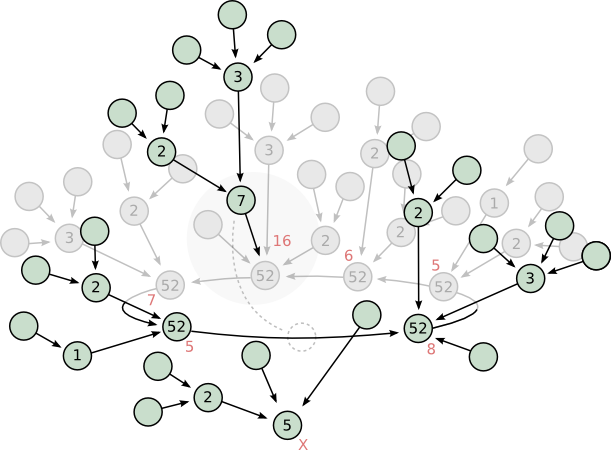 Each voter first identifies the candidate who holds her vote at the end of the cascade (red). She then re-casts for the same candidate in the general election (bottom). Mae is a community leader in the neighbourhood, and the local delegate for the Mayor. When she learns of the plans to improve the park she takes an interest. Mae speaks to Hal. Hal is the local delegate for the Public Health Officer. Mae asks Hal to look into the safety issues of the proposed plan. Hal agrees. He takes the lead in drafting a set of safety amendments. His amendments attract the votes of many parents in the neighbourhood. The votes are numerous enough to ensure that safety concerns are going to feature prominently in the plan. The young planners have a question about the delivery of the sand, so they approach Wen. Wen is a local building contractor, and a delegate for the Public Works Office. He explains that several types of sand are available from the City yards. He says that delivery, however, will depend on budgetary approval. So they add “sand” to the budget section of their plan. Communicative action is action that is coordinated by discussion aimed at mutual understanding or agreement.4 Its application to the structure of power is the topic for the remainder of this section. The subsequent section (3) will address the composition of norms, such as laws, plans and policies. 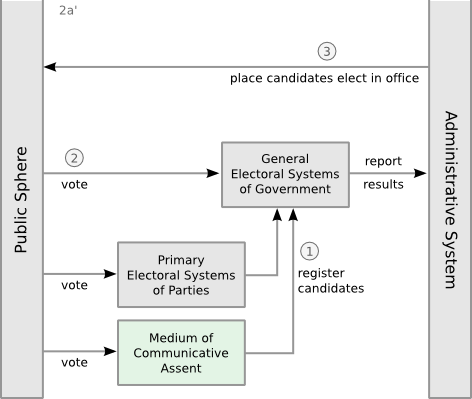 With regard to power, a candidate for executive office may win election through communicative assent (figure 5). She would then be placed at the root of a power structure, as shown in figure 8. Figure 8. Structures of assent and assented power. A candidate is elected to executive office by communicative assent (top). She thus becomes the root node of a power structure (bottom), which she proceeds to assemble. In the case of a mass election, it ordinarilly stops there. But a communicative election may extend its effects deeper into the power structure by influencing the selection of subordinate officers. The rationale for the selection of subordinates will vary, but the main qualifications are perhaps competence, compatability and patronage. All three may be found in abundance among the principal delegates who voted for the executive. In each case, the measure of qualification is the number of votes carried by the delegate. Votes are the measure of competence because they qualify the delegate as a second tier winner — a runner-up in the election — and therefore qualified for the second tier of offices. Votes are the measure of compatability because their acquisition depends on the delegates working together for the successful election of the candidate. Finally, votes are the measure of patronage, because it is only by the assent of the delegates and their voters that the candidate is brought to office; and the rule of patronage is, “you dance with them that brought you”. Figure 9. Assent as scaffolding for the construction of power. The executive (bottom) is likely to appoint her major voters to subordinate offices (squares). They in turn are likely to appoint their own voters. And so on. The major voters of an executive candidate are therefore attractive, in their own right, as candidates for subordinate offices. Any major voter thus appointed is placed at the commanding node of a power sub-structure, which she may further extend by her own appointments. Again, she may look to her own voters for guidance. And so on. The process is recursive. Assent may therefore serve as scaffolding for the construction of power, delegate by delegate, as depicted in figure 9. Once a power structure is assembled, however, the roles are likely to be reversed. Then it is the structure of power that guides, and assent that follows. Consider the case of local leadership in scenario 1.1. The local leader (Mae) holds neither office nor direct power, but she does have a measure of influence as a minor delegate in the mayoral election. She demonstrates this when she champions the park improvement plan and mediates its approval. The reason for her success stems partly from the votes she carries. If her request for official approval had been ignored or rejected off hand, she would probably have spoken to her delegate. At stake for the delegate would be Mae's vote and the several hundred others she is carrying from her neighbours. If the delegate were unhelpful, then Mae could look elsewhere in the power structure, shifting her vote until she found a more effective channel of influence. However, she could not shift her vote with complete freedom. Her own electoral support is based on influence, and to retain it she must continue to direct her vote rootward into the power structure (figure 9, left). As a general rule, votes of assent are constrained to flow within the channels that define the existing structure of power. Figure 10. Stable assent in mid-term. Assent is generally locked into the power structure of the incumbent executive (bottom), and rarely shifts outside of it. Figure 11. A shift of support to a co-delegate. The end of the term is approaching, and thoughts are inclined to the pending decision. A principal delegate shifts her vote from the incumbent to a co-delegate. Figure 12. The co-delegate declares her candidacy. She withdraws her vote from the incumbent, and thus declares herself a candidate for the next term of office. A voter shifts to the rival power structure, giving it a total of 17 votes to the incumbent's 40. Eventually, a new structure of assent will emerge to guide the issue of the next election, the structure of power for the next term. This section explains how communicative assent may be combined with collaborative drafting in order to build consensus on the composition of societal norms (laws, plans and policies). It then suggests how such a consensus might be actualized by government, with an example from a legislative context. Ordinarilly, we might expect a collaborative effort that is focused on a single document, to which multiple drafters push their contributions (see figure 13). Such a centralized pattern of communication is reminescent of mass assent. Participants are constrained to a small number of choices (one in this case), and have no formal outlet through which to express dissent, except perhaps by withdrawing from the process. Figure 13. Typical collaborative drafting. 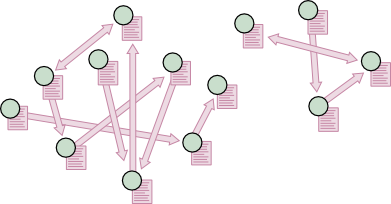 Typical media (such as Wikis) have a centralized pattern of communication in which drafters push contributions to a single, central copy of the text. On exposure to communicative assent, this centralized pattern is necessarily broken apart and dissolved. Voters enter the picture, as we may imagine. They begin individually to express their agreement with the ideas of particular drafters, and to shift their assent freely from one to another. The drafters are thus encouraged, in turn, to express their ideas more clearly. Each takes to composing a separate document that embodies her own peculiar conception of what the norm should be. The text therefore diverges into multiple variants that co-exist side by side, as shown in figure 14. Figure 14. Broken apart and dissolved by communicative assent. Voters express their assent (arrows) for drafters, each associated with a variant draft of the proposed text. Figure 15. Collaboration in a recombinant text. Instead of pushing to the center (cf. 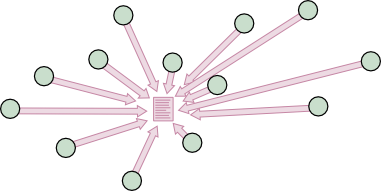 figure 13), authors transfer bits of text from peer to peer. Their lines of communication trace a criss-cross pattern, more-or-less at random. With communicative assent, however, a drafter is not only eligible to receive votes (as a candidate), she may also cast a vote of her own and thus share her votes (as a delegate) with other drafters. Naturally, she will use these shareable votes as leverage in order to disseminate her ideas as widely as possible in the population of variant drafts. The candidate who receives her delegated votes will also be expected to receive her ideas, in the form of textual contributions. Figure 16. Coordinated by drafters and voters, text and assent cascade together. Both seek consensus (bottom) where it may be found. Where it may not be found, they remain apart in dissensus (left and right). The structure of assent is likely to fluctuate considerably during the composition of a norm. Unlike in executive elections, it will not become attached to a power structure. Its only attachment will be to the evolving content of the text. Consequently, the voters will be shifting their assent here and there in attempts to influence the course of the composition. Meanwhile, the drafters will be shaping the text and shunting its flow in order to attract their votes. The resulting interplay is likely to have a complex dynamic, which might be understood, in part, on the basis of numerous contributory patterns. Figures 17 and 18 predict two such patterns (bridging and shorting consensus). Figure 17. Bridging consensus. A drafter copies the text of two dissensus documents (X and Y), and crafts a third that she hopes will bridge them (Z). Two other drafters (A and B) shift their votes in favour of it. These defections will place pressure on X and Y, either to open their own drafts to Z's innovations, and solicit her vote; or to cast their own votes for Z, and thus complete the bridge. Figure 18. Shorting consensus. 1. The consensus drafter (X) has rejected changes proposed by a contributor (T). But a co-contributor (S) is willing to accept them. 2. T therefore shifts her vote to the co-contributor. The co-contributor then withdraws her own vote from X, and thus becomes the new consensus drafter. Two social processes that would otherwise be separate — the building of public consensus among voters, and the composition of a law, plan or policy among drafters — are thus interwoven in the communicative medium. The combined process might be characterized as shifts of assent (actual and anticipated) steering the evolution of the text, pushing and pulling it into shape. So detailed and extensive is their expected interweave, that it will be impossible to disentangle the roles of the voters and the drafters; all will be equally authors of the norm. If they were, in addition, numerous enough to prompt action by government (enforcing the law, executing the plan, or following the policy), then the combination of their individual actions would amount to communicative action by society as a whole (figure 7). For example, consider a legislative process. The medium of assent might serve as an input to the legislature, feeding in bills from the public (figure 19). It would thus function as an alternative to closed-door committees. Figure 19. Legislative relations between the public sphere and the administrative system. Detailing a transformed citizenship interchange (2a' from figure 7) as it would function in the promulgation of laws. The only structural difference from the original interchange (2a) is a medium of communicative assent (green) that is added to the public sphere. Figure 20. A public bridgehead into a legislature. Members of the public and a legislative assembly are jointly participating in the issue of a proposed bill. Their combined votes are currently divided (57 and 38) between two consensus drafts. A separate tally of the in-house votes (red) tracks the likelihood of the bill's passage should it ever be floored. At present, the house is voting 10 and 6 with some members undecided. If the left were to gain 2 more votes, then the bill would have a majority in the assembly. Before the bill could be floored, the assembly would require an official version of the text. This might be obtained by freezing the consensus draft for a period of time. No modifications would be permitted during this time, but the voters would remain free to shift their votes. If the consensus nevertheless held, then the assembly could proceed to ratify the bill. It would then become law. In this way, law making might be opened to the public without requiring any structural changes to government. The changes would be entirely in the public sphere. In an electoral context, normative opinion is formed in electoral primaries. People (as a public) roughly agree on who is fit to hold office. Authoritative decisions are then made by the same people (now as private individuals) in official, secret-ballot elections. There the electoral power of the elector shapes the administrative power of the newly elect, who (as officers) now gain the exclusive right to issue further authoritative decisions. Meanwhile, the public retains the right of normative guidance. Their capacity to guide the administrative power of elected officers is enhanced by their ability to reach large-scale consensus on the laws, plans and policies that ought to be executed. Thus the normative and authoritative — the recognition of what ought to be done, and the doing of it — are kept separate; the normative going to the communicatively-structured public sphere, and the authoritative to the power-structured administrative system. Union operation. Thus “X + Y” means “both X and Y in combination”. - emplacement of an official. - enforces a single vote per person (no sock puppets). But M(c) ensures that any OP(f) dissensus that is not grounded in social reality will be unstable. It will therefore fall toward consensus. So we can expect consensus. Any consensus that attracts a quorum of voters (however defined), and that holds stable, is PD by definition. In other words, the general elections of RD will actualize the primary elections of PD(o). Thus officials will be emplaced - A(o) - by public decision. Likewise for the other types of norm (n). So, when PD(n = policy) is expressed, the elected executives will act to follow that policy. When PD(n = plan) is expressed, they will act to implement that plan. Given that RD and FS are constitutional facts, the immediate cause of the direct democracy DD is the introduction of the medium of assent M.
This section asks the question: What if a medium of communicative assent were applied to the composition of utopian literature? The idea of using a recombinant text to open utopian works to public participation was already briefly suggested.22 This section raises the possibility of introducing formal assent to that medium, such that participants are able to guide the composition by their votes, and to reach consensus on the issue. Howard Segal looks into the reflective and steering capacities of ‘serious utopian visions’. According to Segal, a serious utopian vision is a kind of reflection of larger society. It functions best not as a literal blueprint for the future, but as a critical representation of the present, and as a possible motivation or guide for change.23 But the introduction of assent might have the effect of firming up these functions, making the representation more literal, and the guidance more compelling. (a) Consider that “literature” is intended to include other forms of expression that are suitable for utopian visions, such as theatre or film, and so forth. (b) With reference to figure 21, consider how utopian literature may be different from other cultural fields. Consider it from several perspectives: inter-subjectively engaging in its collaborative composition; subjectively reading it in private; and objectively considering its end effects within the various worlds. Utopian literature seems to have a unique potential to bind together the separated worlds, attitudes, and rationalization complexes that make up modern society. Figure 21. Rationalization complexes in modern society. From Habermas,TCA1.238 copied without permission from Google Books. 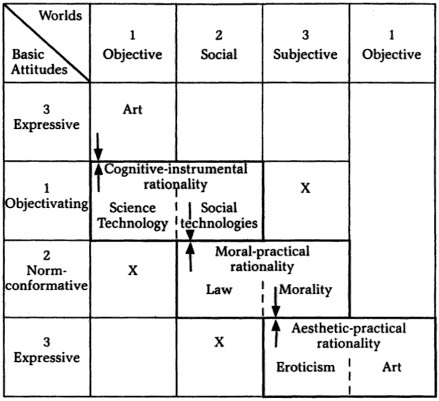 (c) What is the connection between reason and rationalization in this context — between the tripartite bindings of formal pragmatics, and the tripartite bindings of utopian literature — between communicative action and mutual understanding in the small, and utopian works and visions in the large? Gillan refers to HabermasTCA1.249 in stating that “the unity of rationality is procedural and not substansive”.26 One does not inspect the content of the message, but rather the process of its construction and conveyance. So we might look into whether the binding capacity of a utopian consensus is not likewise procedural as opposed to substansive. In there any connection here with the procedure of cascade voting, and the fragmented contents of a recombinant text? A recombinant text is certainly a text of rationalized content, one that can spread itself out to match the rational structure of the differentiated lifeworlds. So an artist's copy of the text need not be the same as a scientist's or a politician's, and all are free to work independently or in collaborations of their own choosing. At the same time, cascade voting is certainly a unifying procedure. Like discourse in an ideal speech situation, it shapes the text toward consensus without ever forcing it. (d) Assume these competing centers, as Habermas describes. Assume also that one of them is a utopian vision on which a broad and deliberate consensus has formed. Would it thereby rise above the others to become the actual center of reflection? From what quarter might this rise be challenged? On what grounds? And finally, is there (or ought there to be) an executive center in society that could complement a reflective center? (e) Furthermore, consider that a consensus on a utopian vision would imply the acceptance of its rationality in all three modes (figure 21). So people would generally think that its content was true in a scientific sense, and feasible in a technical and social sense; they would generally agree that its intention was just and morally right; and they would generally perceive that its expression was aesthetically beautiful. What personal, social and societal effects could be expected to follow from this? (f) Consider the time prior to a consensus, when multiple utopian visions are competing and there is no guarantee of them ever coming together or being bridged. What personal, social and societal effects could follow from the ongoing attempt? Or from the ongoing failure? What is the equivalent theory for a valid text that is not historic but utopian. The text is validated not by a tradition that was formed in the past, in this case, but by a consensus that is formed in the present. Embedded in that consensus is a pre-given mutual understanding. Can this mutual understanding be taken as the equivalent of hermeneutic understanding? It would then be a variable on the input side, and not a product. If moreover the application of the utopian text can be said to result in a fusion of horizons between the present and the future, then what would be the product of that fusion? Would it be the future itself? In that case, the turn toward that direction would also be a turn from the epistemic to the ontogenetic, from an orientation of understanding to one of creation. (h) These textual lenses (g) seem to reveal many pasts and one future. Multiple traditions validate multiple texts for interpretation, in each of which we perceive a more-or-less different past. Meanwhile, the future is revealed (if at all) in a single view, because the only mode of validation in this direction is consensus. This is counter-intuitive. We expect a single past (that actually was) and multiple futures (that yet might be). The single future is not a social limitation of consensus, however, but a physical limitation of worlds. We think in terms of one shared world. But if the vision of the future can reach far enough in space and time, then it becomes possible to accomodate multiple physical worlds. If it can reach farther still, such that the space/time between contemporaneous worlds is socially unspannable (as in light years) then those worlds will be independent of each other. The second consequence of such a dispersed setting is that it holds the promise of safety. Remoteness is the guardian not only of diversity, but also of existence. Any realistic vision of the future is likely to be haunted by the possibility of mutual destruction, but that possibility is ultimately precluded by distance. (It is precluded by nothing else.) Art may clothe the setting in whatever form brings it home — down to earth and into the present — it need not be a tale of science fiction. What science there is must be sound in principle, but not necessarily explicit in detail. Inalienable transitive methods are described by Ford (2002) and Lomax (2003) for the purpose of constituting an assembly,20, 8 and by Miller (1969), Green-Armytage (2003) and Allan (2007) for direct legislative voting.27, 21, 9 Votes are inalienable in all of these methods because the voting is continuous and the voters free to withdraw or shift their votes at will. Continuous primary voting: Vote sellers can shift their votes after taking the money, perhaps re-selling them to other buyers. This makes vote buying a poor investment. Full disclosure: Buyers, sellers and systematic pressure by others (employers, unions, churches, and so forth) are detectable by statistical pattern analysis of vote shifts and dispositions in correlation with facts (known buyers and sellers, workforce structure and dynamics, and so forth). Separation of primary from decision systems: Public and private voting may be interrelated through separate electoral systems: a public vote in the run-up (primary system) culminates in a private vote on election day (decision system). The final private vote (secret ballot) filters out individual instances of coercion and vote buying. A similar strategy may be applied to normative decisions. Here the decisive vote is not private, but is instead restricted to a small number of people, such as elected assembly members. Concerns of coercion and vote buying are thus also restricted to that smaller group of people, who may therefore be closely monitored and scrutinized. The structuring of power and the composition of norms by communicative assent. Election Methods. 2009.1.16, 19. Family pressure in public voting. Start/Metagovernment. 2011.5.7. Upgrade Democracy Report. Contact. 2011.12.9. In a public, as we may understand the term, (1) virtually as many people express opinions as receive them. (2) Public commununications are so organized that there is a chance immediately and effectively to answer back any opinion expressed in public. Opinion formed by such discussion (3) readily finds an outlet in effective action, even against—if necessary—the prevailing system of authority. And (4) authoritative institutions do not penetrate the public, which is thus more or less autonomous in its operation. When these conditions prevail, we have the working model of a community of publics, and this model fits closely the several assumptions of classic democratic theory. At the opposite extreme, in a mass, (1) far fewer people express opinions than receive them; for the community of publics becomes an abstract collection of individuals who receive impressions from the mass media. (2) The communications that prevail are so organized that it is difficult or impossible for the individual to answer back immediately or with any effect. (3) The realization of opinion in action is controlled by authorities who organize and control the channels of such action. (4) The mass has no autonomy from institutions; on the contrary, agents of authorized institutions penetrate this mass, reducing any autonomy it may have in the formation of opinion by discussion. C. Wright Mills. 1956. The power elite. Oxford University Press, New York. pp. 303-304. With regard to voting systems, see also: Influence of a single vote. Duncan Black. 1969. Lewis Carroll and the theory of games. The American Economic Review. 59(2). p. 210. Rodriguez and Steinbock et al. 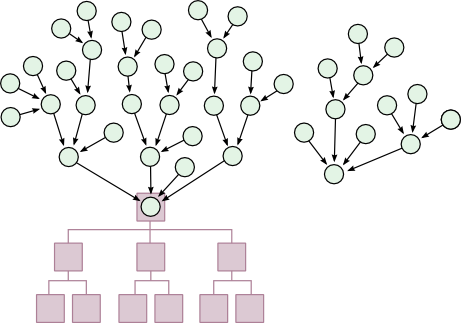 describe a system of 'dynamically distributed democracy' that involves transitive delegation. Unlike a delegate cascade, however, the votes are alienated from the original casters. The intent is to improve the efficiency of the decision making process by removing voters from the direct discussions. 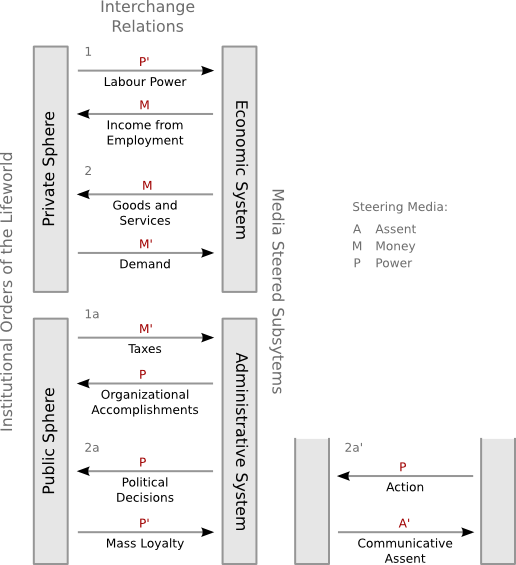 The system might therefore be classified as a steering medium that functions as a substitute for communicative action. Its design and purpose are therefore different from the medium of communicative assent that is proposed here. Marko Antonio Rodriguez, Daniel Joshua Steinbock. 2004. 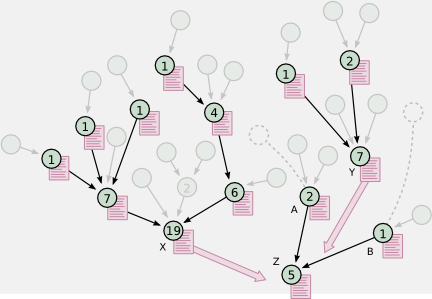 A social network for societal-scale decision-making systems. NAACSOS '04. Proceedings of the North American Association for Computational Social and Organizational Science Conference. Pittsburgh, Pennsylvania. Marko A. Rodriguez, Daniel J. Steinbock. 2006. The anatomy of a large scale collective decision making system. Los Alamos National Laboratory Technical Report. LA-UR-06-2139. 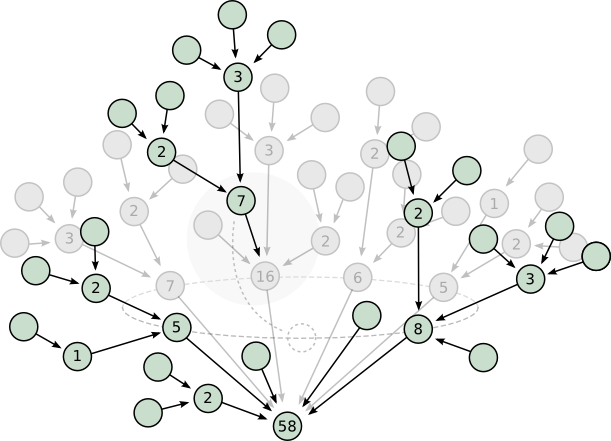 See also: Forum post on graph dbs, voting vs. process, etc. OWS FGA. 2012.1.25-26-. Lomax describes a method of constituting an assembly by proxy. The proxies are continuously reassignable, transitive, and typically include voting rights in the assembly. 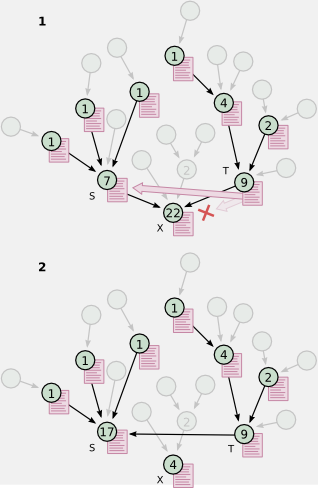 This method differs from a delegate cascade in its more restricted purpose. It is not generally applicable to single winner elections, or to direct voting on laws and other objects of assent. Sergey Brin and Lawrence Page. 1998. The anatomy of a large-scale hypertextual web search engine. Computer Networks and ISDN Systems. 30, pp. 107-117. Their PageRank algorithm for ranking web pages, is based on links. A link to a page is considered a “vote” for that page. 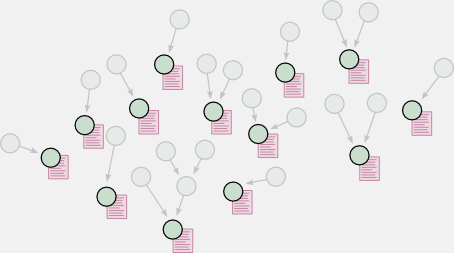 The algorithm is recursive, allowing the vote to traverse the target page's own links. PageRank differs from a delegate cascade in that a single page may directly vote for multiple pages. Votes consequently multiply or split apart, instead of cascading together. Votes also diminish in strength (are “dampened”) as they traverse the pages. Another common type of election is based on party-list proportional representation. In this type of election, the voter would translate her vote by recalling the party of the candidate who currently holds her vote in the cascade, and casting a vote for that same party at the general polling station. The party would calculate its candidate list from the cascade. It would use an algorithm similar to that of the general election, typically one based on the highest averages method. For discussion of how it applies to delegate cascades, see Delegate cascade and proportional representation. Applying it to all cascades would yield a general all-party list (predicative of the final election results), which could then be divided by affiliation into a set of specific party lists. 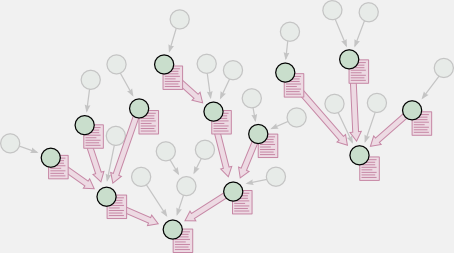 Text might be pushed downstream in a “cascade of Wikis”, with the downstream drafters editing the contributions (either lazily or eagerly). Or text might be pulled with the aid of various tools; anything from recombinant text, to diff/merge, to manual copy and paste. In the case of communicate assent, however, the substitution is purely formal. Behind the formal expression, behind every accumulation of votes that betokens a consensus, there is an actual consensus. This is guaranteed by the freedom of the participants to withdraw their votes or to shift them as they please. So the formal expression of assent is a product of communicative reason, and its steering capacity derives from that association. I had originally thought that the formation of deliberate vote cycles (decision rings) would be useful in guiding power shifts. I no longer think they are necessary. The idea is summarized in the following diagrams, the first two of which set the stage. Figure 22. Rigid assent in a power structure. Ordinarilly, assent for an executive office is locked into the power structure of that office, and cannot shift freely. Figure 23. Unstable assent in a power vacuum. The principal delegates signal their readiness for change by withdrawing their votes from the incumbent. But the ensuing process may be overly sensitive to their initial vote shifts, making it chaotic. And it might be difficult to initiate the process if a large minority still supports the incumbent. Figure 24. A decision ring. The principal delegates cast their votes in a massive cycle, and thus catapult ahead of the incumbent (52 votes to 5). Figure 25. A delegate backs a candidate. The delegate exits the ring and casts her vote back into it, lending her support of one of the remaining candidates. The candidates in the ring all share the same vote flow (52), and are therefore equal in assent. But the decision can also be quantified by the flow of votes entering the ring (red), as distinct from the cyclic flow within it. The sources of votes for this separate count are restricted to the ring candidates and their voters. No spoiler (such as the incumbent) can contribute to the decision, unless first invited into the ring. The argument of direct democracy was initially presented and discussed in the election-methods thread, Time of trouble - premise 2. So Y can have multiple independent causes, or generation paths. There is perhaps Y on some path without X preceding; but there is neither X nor Z on any path without Y following. One medium of communicative assent that meets the requirements of the argument M(a,c,p,r,s) is being developed as part of project Votorola. Howard P. Segal. 2005. Technological utopianism in American culture. Twentieth Anniversary Edition. Syracuse University Press. Jack Mendelson. 1979. The Habermas - Gadamer debate. New German Critique. 1979, no. 18, pp. 44-73. As reproduced in: The Frankfurt School: critical assessments. Volume VI, pp. 40-55. Edited by Jay Bernstein. 1994. Routledge, London and New York. Garth Gillan. 2000. Communicative action theory and the possibility of theology. In Perspectives on Habermas. Edited by Lewis Edwin Hahn. Open Court, Chicago and La Salle, Illinois. James Miller. 1969. A program for direct and proxy voting in the legislative process. Public Choice. 7, pp. 107-113. 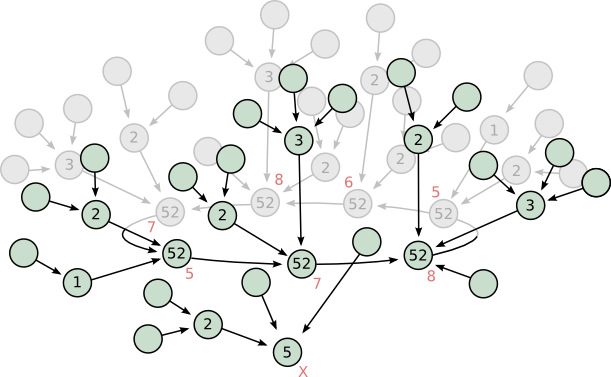 Further restrictions of node size (fixed at B, where B = 3), random assignment to nodes, and no withdrawal or shifting of votes, would result in a method similar to Gohlke's “practical democracy” (next). 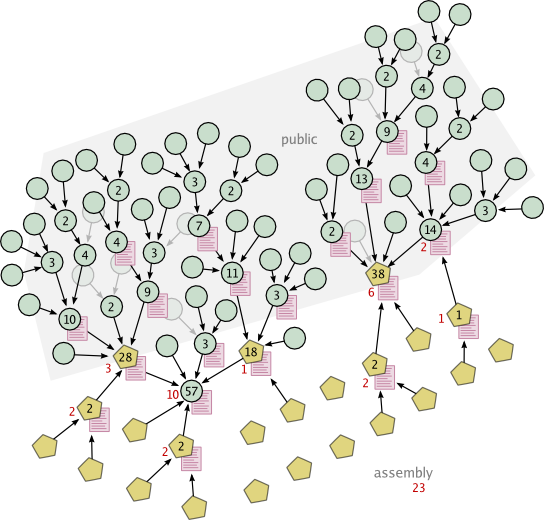 Since these differences are expressable entirely as restrictions of voting, it may be possible to implement practical democracy using a casade voting engine, provided the engine is suitably configurable. See for example the discussion thread Implementing Practical Democracy with Votorola. Free-range voting & decision-making. Start/Metagovernment. 2010.2.8-18, 19. Social voting vs. administrative decision. Occupy-dev. 2011.11.16-22. Online primary and GA systems. Occupy-dev. 2011.12.4. Differences between Votorola and LiquidFeedback. Votorola mailing list. 2012.6.16. Deliberation and voting. Start/Metagovernment. 2012.8.26. Primary guidance and authoritative decision. Start/Metagovernment. 2013.7.14-. Chain climbing. Election Methods. 2014.4.27. The utilitarian miscalculation. Center for Election Science. 2014.6.6-. Cooperative tools for planning the home page. Start/Metagovernment. 2014.6.27-. Ford (2002, pp 6-7) describes similar categories under the terms "directive" and "executive".20 The terminology of normative "opinion" vs. authoritative "decision" is here borrowed from AG Meinungsfindungstool, e.g. as described in this post by Marc. For a related discussion, see also the thread: An artist's view on voting methods. Election Methods. 2012.12.2-29. While base candidates alone may hold votes, not every base candidate necessarily does so. The hold count of a base candidate may be zero if he/she has impersonal voters, because their votes have zero weight. Copyright 2007-2009, 2011-2013, Michael Allan. Permission is hereby granted, free of charge, to any person obtaining a copy of this software and associated documentation files (the "Votorola Software"), to deal in the Votorola Software without restriction, including without limitation the rights to use, copy, modify, merge, publish, distribute, sublicence, and/or sell copies of the Votorola Software, and to permit persons to whom the Votorola Software is furnished to do so, subject to the following conditions: The preceding copyright notice and this permission notice shall be included in all copies or substantial portions of the Votorola Software. THE VOTOROLA SOFTWARE IS PROVIDED "AS IS", WITHOUT WARRANTY OF ANY KIND, EXPRESS OR IMPLIED, INCLUDING BUT NOT LIMITED TO THE WARRANTIES OF MERCHANTABILITY, FITNESS FOR A PARTICULAR PURPOSE AND NONINFRINGEMENT. IN NO EVENT SHALL THE AUTHORS OR COPYRIGHT HOLDERS BE LIABLE FOR ANY CLAIM, DAMAGES OR OTHER LIABILITY, WHETHER IN AN ACTION OF CONTRACT, TORT OR OTHERWISE, ARISING FROM, OUT OF OR IN CONNECTION WITH THE VOTOROLA SOFTWARE OR THE USE OR OTHER DEALINGS IN THE VOTOROLA SOFTWARE.